Location: River Ness, Inverness, Scotland. Opening times: Check their website for more info. Opening times: Check their website for more info. 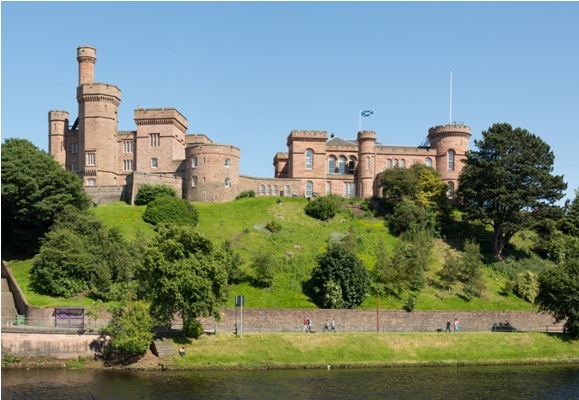 Notes: Inverness Castle (Scottish Gaelic: Caisteal Inbhir Nis) sits on a cliff overlooking the River Ness, in Inverness, Scotland. The red sandstone structure evident today was built in 1836 by architect William Burn. It is built on the site of an 11th-century defensive structure. Today, it houses Inverness Sheriff Court. There has been a castle at this site for many centuries. The castle itself is not currently open to the public, however a recent campaign has led to the creation of a working group to explore the possibility of doing so in the future. At present, only the castle grounds are open to the public.